A new extension to USB that will enable sharing of various USB peripherals between computers is now available. The new MultiSwitch hub technology, developed by SMSC, allows the sharing of information and content from devices such as DVD players, cameras, printers, and scanners between laptops and desktops using a simple USB cable. Future hubs may also allow wireless sharing of peripherals. In April 2006, SMSC introduced the first USB sharing hub chip. As the first product based on this technology to approach the commercial market, TFOT checked out this latest innovation that is hoped to make our computing life a bit simpler. Universal Serial Bus (USB) is a widely used hardware interface or connectivity standard for attaching peripheral devices to computers. It was developed and introduced in the mid 1990’s by an interest group that included Compaq, DEC, IBM, Intel, and Microsoft. USB 1.0 was released in 1995, but it took three more years and several improvements to the original standard before a more widespread adoption occurred with the introduction of USB 1.1 in 1998. USB was developed to simplify the installation procedure of various peripheral devices, which at the time used serial and parallel ports, required all sorts of drivers, and was slow. The original USB afforded an impressive 12 Mbps transfer rate, connection of up to 127 devices at a time, and had a plug-and-play installation, which (at least on paper) required no drivers. Although USB 1.1 turned out to be a success, it was still too slow for certain applications that required higher bandwidth, such as storage and video. In the late 1990’s, the common high speed standard was FireWire (IEEE 1394), which had a 400 Mbps transfer rate and was developed by Apple about the same time as the original USB. Intel was required to pay a fee to Apple each time it used FireWire, so it decided to push the development of its own high speed connection, which led to the introduction of the 480 Mbps USB 2.0 in 2000 (revised in 2002). The USB 2.0 was an almost immediate hit and today it is the most common PC and peripheral connection incorporated in billions of devices worldwide, such as DiskOnKeys, cameras, mice, keyboards, TVs, and even a toothbrush. Over the years, several extensions to USB were developed including USB On-The-Go, allowing devices such as cameras, pocket PCs, and printers to transfer data directly to one another without the mediation of a PC. Another addition, which will soon join the USB family, is Wireless USB (WUSB), which uses Ultra-Wideband wireless technology to transfer high speed data up to a distance of 10 meters. USB’s ability to connect simultaneously to dozens of peripheral devices led to the development of USB hubs so that the limited number of ports doesn’t limit the number of devices that can be connected simultaneously to a computer. Using a USB hub, four or more peripherals may be connected to the same computer. However, until now, there has been no simple way of sharing USB devices between computers. 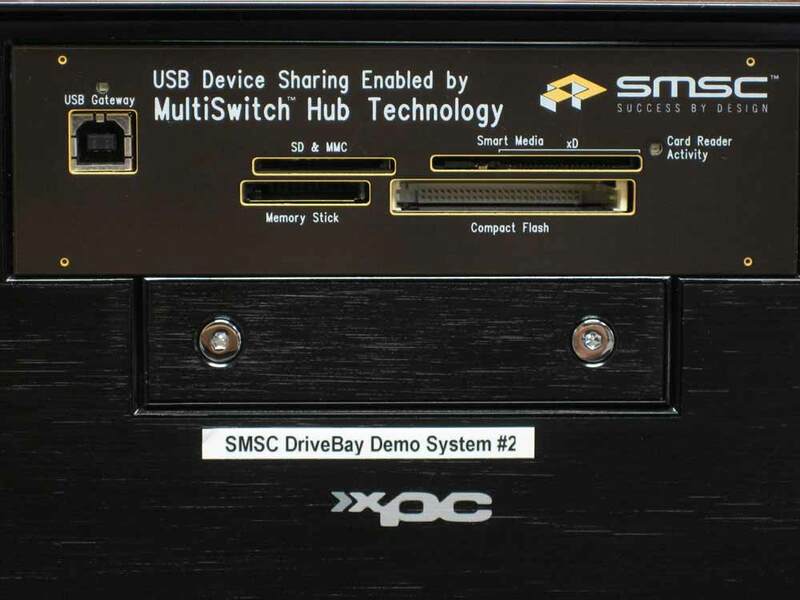 To allow sharing of various peripherals such as scanners, cameras, printers, and hard drives between computers, SMSC developed a new technology called the MultiSwitch Hub. This chip can be embedded in the host machine (desktop computer, laptop, or even a game console). A host machine attached to several USB peripheral devices can directly connect to another machine via a USB cable. 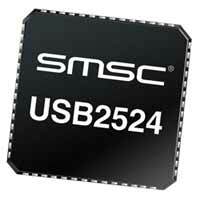 The SMSC chip can be used as a switch to control which machine uses a specific USB device at a particular time. Currently, some USB peripheral devices such as printers and external hard drives can be shared using a local area network (LAN). Such a solution is not always desirable, however, due to its complexity as well as security concerns. Furthermore, connection through present-day networks of many other peripherals such as scanners, cameras, and PDAs is not possible at all. According to SMSC, future models of the MultiSwitch may have wireless functionality as well. A laptop computer will be able to use a WUSB connection to wirelessly connect to devices attached to a host desktop. 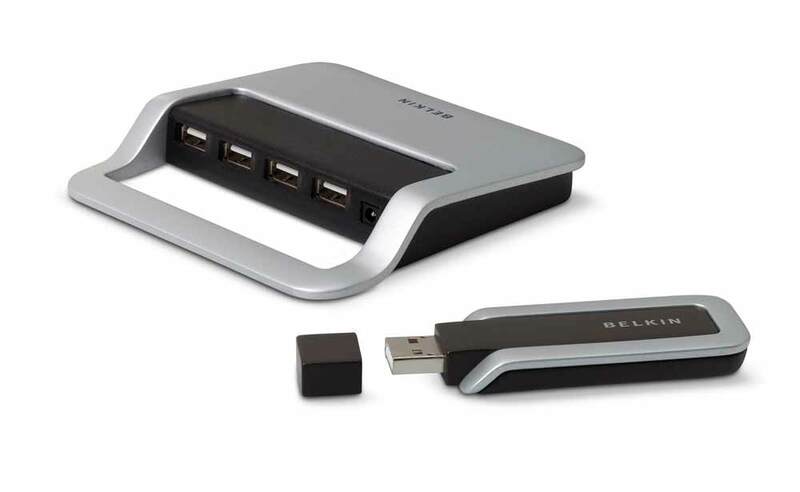 Current WUSB technology, like the recently announced Belkin Cable-Free USB Hub, has drawbacks, however, as only the upstream connection from the hub is wireless and the downstream connections remain as wired connections due to the current lack of WUSB peripherals. This may limit the adoption rate of these 1st generation devices. However, by using the MultiSwitch technology, these products can enable sharing of wired peripherals between the wired (i.e., desktop) and wireless (i.e., notebook) environments, which are very common in today’s multi-computer homes and offices. Although the first MultiSwitch hubs have not reached the market yet in OEM customer designs, they are expected to become available in early 2007. To learn more about the MultiSwitch technology, TFOT interviewed Steve Nelson, Vice President of Marketing for SMSC’s Connectivity product line. 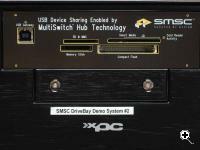 Q: How does the new SMSC MultiSwitch Hub work? A: The SMSC MultiSwitch Hub chip is embedded into a host device (e.g., a PC, a laptop, a game console, or a digital video recorder), which is typically equipped with an attached “constellation” of USB, such as a printer, a scanner, a digital camera/card reader, a pen drive, etc. It is possible to connect a standard USB 2.0 cable from, say, a laptop to a PC and share all or some of the devices connected to the PC, i.e., using a laptop, one may print, access images on the card reader, etc. The sharing or switching scheme is dependant on how the PC and/or laptop configure the switching. Some may choose to switch/share every peripheral automatically, without any user “intervention”, while others may enable automatic switching/sharing with user-selectable options. An OEM’s major concern is not deploying devices that elicit support calls. Actually, only a single standard USB 2.0 cable is required in order to share devices between two hosts equipped with the USB MultiSwitch Hub. (However, in the case of an external USB sharing Hub, there will be two wires – one for each computer). Q: When a new peripheral device is plugged into a USB hub, a pop-up window usually appears on the OS. Does the window pop up on both computers when a peripheral is plugged into the new MultiSwitch hub? A: In the case of Windows, the devices to be shared (switched) reside on one of the hosts and are seen in the Explorer pane. Once switched/shared, they “disappear” from that Windows Explorer pane and are recognized and enumerated (USB lingo for “identified by device category”) and then appear on the second host. In the above example, the devices initially appear in the desktop PC’s Windows Explorer pane. When the laptop plugs into the desktop and the “switch” occurs, the devices being “shared” by the laptop now appear in its Windows Explorer pane. On a Mac, the devices appear and “disappear” on the desktop. Q: What happens when two people try to use the same device at the same time from two different computers? A: Keep in mind that USB provides a connecting technology and not a network. Since the USB MultiSwitch Hub is a standard USB 2.0 device, only one person can use a connected device at a time. For example, I plug in my MultiSwitch Hub-enabled laptop, share your printer and/or get what I need from an external USB hard drive and then, when you want it back, we switch the devices back to you. If we want to toggle back and forth, we can do that. But only one of us can access the desired USB device at a time. 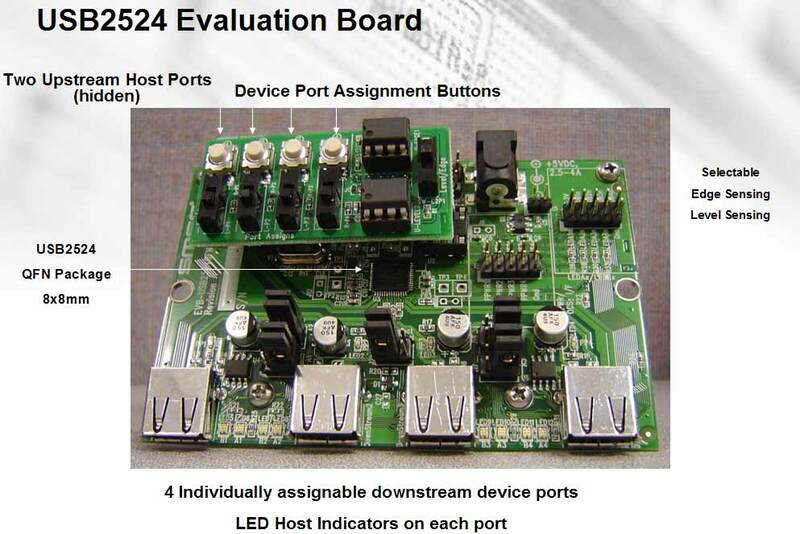 Q: Are you currently working on a wireless USB sharing hub? A: SMSC’s MultiSwitch technology can be leveraged for wireless configurations. In this scenario, a “wireless” laptop would connect to a USB MultiSwitch-enabled hub via a dongle and has access to all USB devices connected to the MultiSwitch Hub. In this instance, the upstream port(s) are wireless; the downstream ports have cables. The reason for that is that cost of connecting USB devices wirelessly is prohibitive while cables are cheap. Furthermore, many USB devices are not designed to be networked – unless you want to pay a significant sum of money and deal with the complexity of software configurations, etc. Q: When will MultiSwitch Hub-based products reach the market? A: SMSC launched the devices in April 2006 and has been actively engaged in customer design activity. The first manufacturers are expected to introduce the product to market in early 2007.